Dylan Browne's Caffeine takes place in a world where caffeine is a "necessity", making it different from our Earth in precisely zero ways. *slurps cup of tea*. *puts kettle on*. *slurps cup of coffee*. A year ago, Browne reached but 4% of his IndieGoGo crowdfunding target, but a new trailer has appeared to confirm Caffeine's continued development. 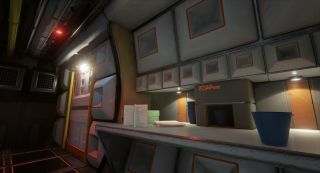 The spooky-seeming sci-fi horror adventure is now a three-part episodic game (parts two and three will be covered by the initial cost of the game, but released later). However, it still concerns a young boy "seemingly alone" on a space station, and it still makes a damn good case for Unreal Engine 4. You can download an early demo of Caffeine here.